Like all major cities, Orlando has many hospitals, labs, and doctor’s offices. Each of these important facilities contain precious materials that must be stored at specific temperatures in medical refrigerators. They must safely store vaccines, blood samples, injections, and medications without needing to constantly worry about them. All Temp, an air conditioning and refrigeration company, has specialized in customizing unique units for all medical refrigeration in Orlando. All Temp spares no expense and ensures all medical refrigeration units are installed with the best equipment available making them a necessity in quality and reliability. Although these units are expected to run for a long period of time, eventually all refrigeration systems will require maintenance. For all your maintenance needs, All Temp offers service agreements that can even be customized for specific needs. Any issues with old gaskets and coolant levels can be fixed, deep cleaning for hard to reach areas of the unit, as well as many other problems that arise can be taken care of by All Temp’s team of trained technicians. With their constant maintenance checks, the risk of losing any sensitive materials greatly decreases. Along with precious medical items being kept safe, unnecessary costs for fixing any damages are avoided and electrical bills stay down. Companies requiring medical refrigeration in Orlando know it’s vital that their refrigeration units be installed properly and maintained by a reliable company. All Temp has taken the time to carefully provide the best service possible so medical professionals know their systems will be running strong without any problems. 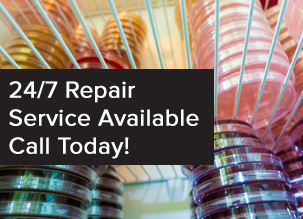 If in any case an unforeseen issue does arise, however, All Temp has professionals ready to assist you Monday through Friday between 8:00 AM and 5:00 PM. All Temp also understands that emergencies happen and immediate assistance may be needed even during off hours. If this occurs, emergency services are available all days of the week, every hour of the day. When the time comes for your medical business to find the right medical refrigeration in Orlando company to solve any of your needs, contact All Temp at 407-857-7800 (Orlando Area) or 813-630-9400 (Tampa area) for any questions.